I know Valentines Day is 3 and a half weeks away still but I personally like to get any sort of gifts or plans finalised for an occasion way before it actually happens. I always like to be one step ahead and organised so todays post is about some beautiful Ineffabless Jewellery. I did a post a while back on some of their other gorgeous rose gold pieces which you can view here. It’s no secret, all women love jewellery. The fact that there are so many different types, finishes and colours of jewellery makes it a super universal and personal gift too. 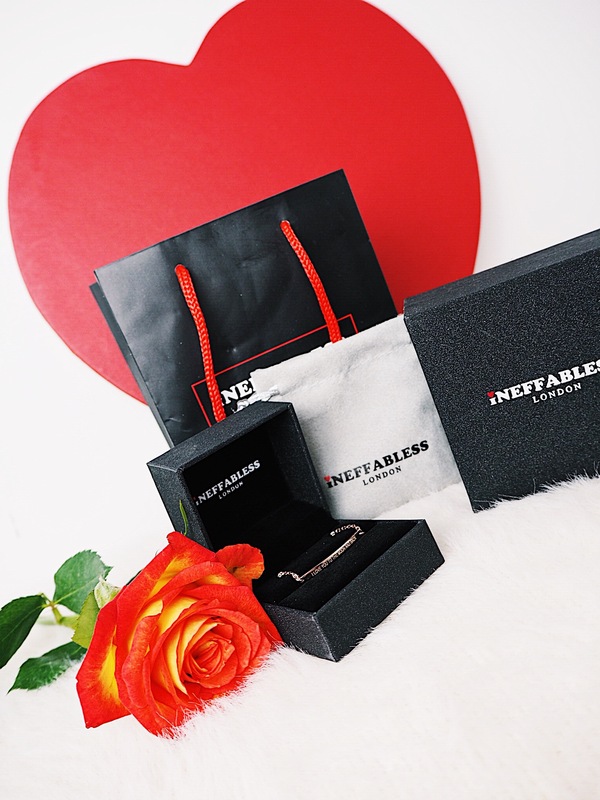 Even after all of this, you could even go the extra mile and have it actually personalised for your special someone which is where Ineffabless come in. 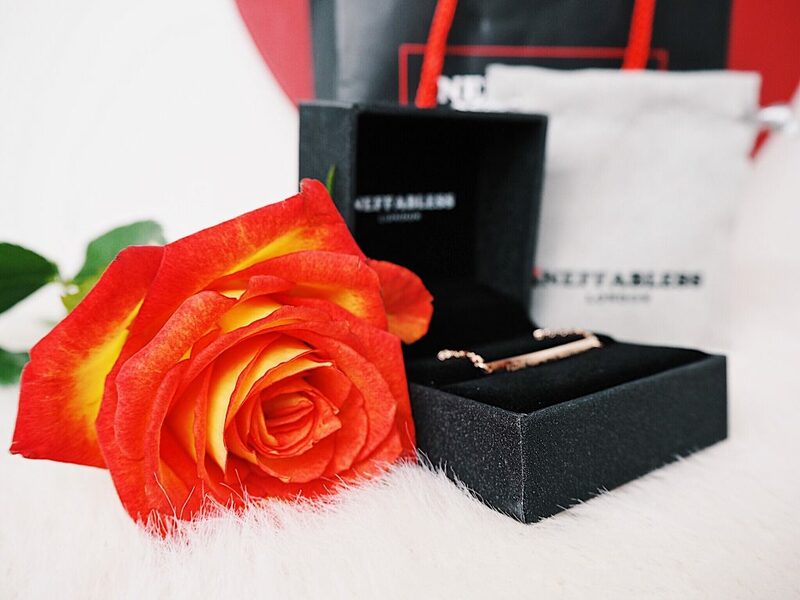 They kindly sent me two pieces of super pretty personalised rose gold jewellery which would be an absolutely gorgeous gift for a loved one this Valentines. Of course I had to get this with Jake and I’s names on and I think it’s super adorable. It’s just the right size to be noticeable but not big enough to the point where it’s too much. The pendant is sturdy and well made and it comes in a lovely box with a polishing cloth and suede bag for no extra price. £57 is the full price of this item but Ineffabless always have brilliant deals on their site with money off of their jewellery. There are so many different types of the Name Necklace that you can buy too if this particular one isn’t up your street. You can check out all different styles of the Name Necklace on their site here. This is such an adorable and dainty bracelet and it also comes in regular Gold and Silver. 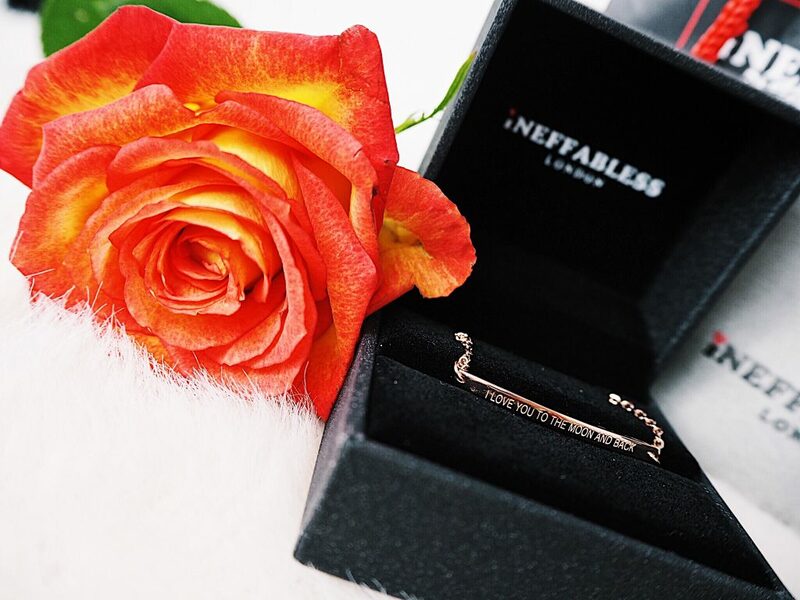 It’s one of those jewellery pieces that you could easily wear every day with any outfit which is what would make it perfect as a sentimental gift. It also has a really cute little heart on the opposite side of the bracelet to the clasp too which adds an extra special element to it. What’s the nicest gift you’ve ever received on Valentines? 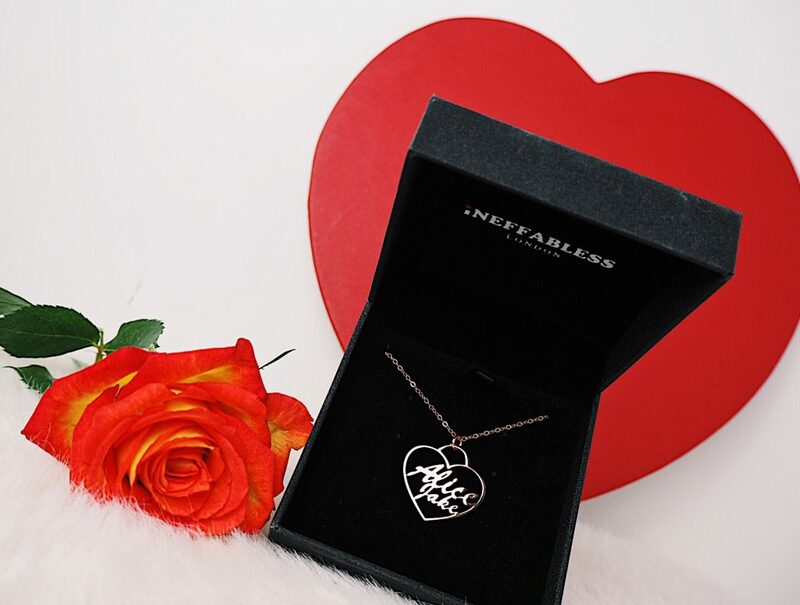 Would you like to receive a name necklace from your loved one? "Bomb Cosmetics Razzle-Berry Bath Blaster!" "Make Up Revolution Redemption Palette Iconic 1!" These are so cute! I love the necklace with both of your names in it and I dont think I’d take the bracelet off! These are both adorable! I love them a lot, especially the necklace, it’s super sweet. I definitely need to get something like that for me and the partner. I love personalised stuff, especially for celebrations like Valentine’s Day and your anniversary. Definitely need to check out this company, thank-youu for introducing them to me! They look stunning! Jewellery is such a nice gift to receive, even if you don’t wear a lot of accessories! I love the personalised touch to it as well. Very good idea! Oh this is the cutest idea. I’d love one of these !! Aren’t they adorable pieces?! I love them! Omg wow that necklace is amazing! It’s really cute isn’t it 🙂 I love it! I love that bracelet! It’s so cute and dainty! 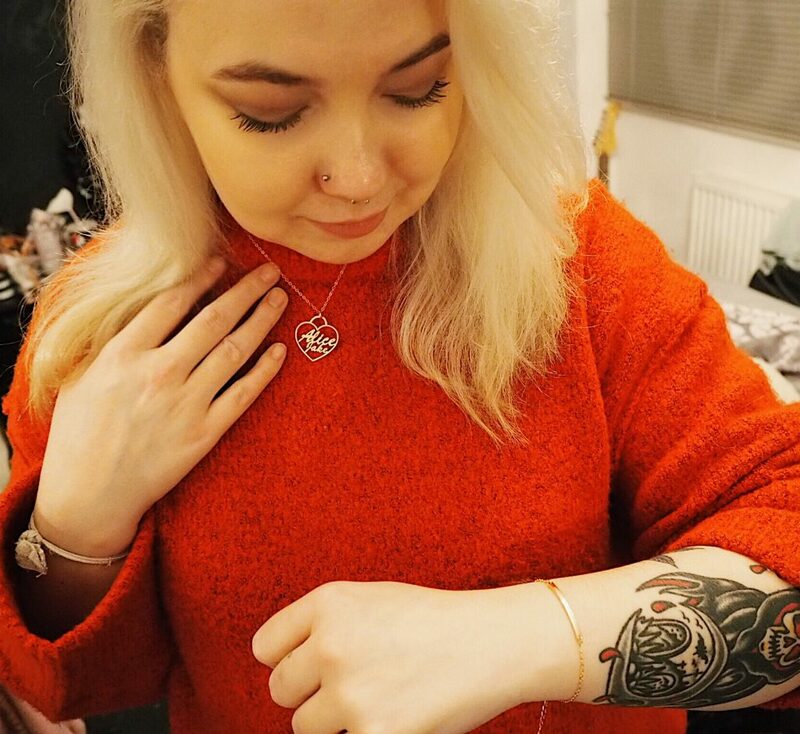 I’m obsessed with personalised jewelry. I think it’s the coolest thing! Would definitely be keen to get something like this on Valentines Day! In LOVE with that bracelet ?? and Aaron and I used to get each other loads of stuff for Valentine’s Day (before we ended up getting so much card shop stuff we ran out of ideas lol), I’ve gotten many a pandora charm, necklace or bracelet and treasure them all! Lovely post ? I don’t think you can beat a nice bit of jewellery for a gift, especially if its personalised! That name necklace and the bracelet are super cute! I love anything that’s rose gold and these are right up my alley!